These Aftermarket Mirrors are like OEM at 1/4 the price. Caution: Be careful snapping mirror heads onto mirror arms not to break glass, especially during Cold Weather. 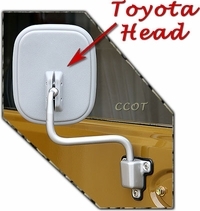 Pry apart mirror head ball slot to allow arm ball to easily insert into back of mirror. No returns on broken heads. 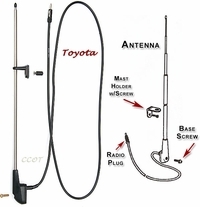 FJ40 Mirror Relocation Kit - CCOT has a solution for fitting Late Model FJ40 Mirrors to Early Model Cruiser Doors. 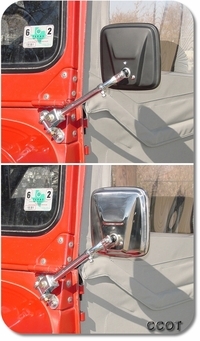 Older model FJ40 mirrors ('76 & Back) have been discontinued by Toyota, however ('77 & Up) mirrors can be installed to retain that stock FJ40 look. 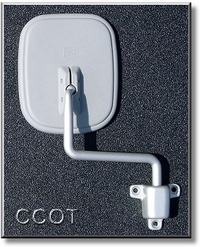 Complete Kit for Installation of 2 Mirrors. Relocation Kit Sold with Mirror Purchase Only. 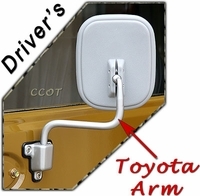 Eliminates Passenger Side "Blind Spot"
Tip: Mirror arm ball sizes vary, add lock washer to bottom of Mirror socket to take up slack if need be. Pair of Telescoping Mirror Arms and Heads. Right and Left Hand Side Mirrors. OEM clones to Arms & Heads. 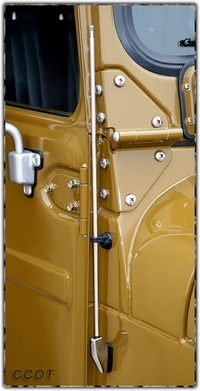 Affordable Solution when running Soft Top or softdoors. Head are Aftermarket OEM Style. Developed by CCOT for great savings. Broken Set Screws or Nuts are not Warranted. Note System will add $5 for each wide angle mirror selected. Very High Quality combination. 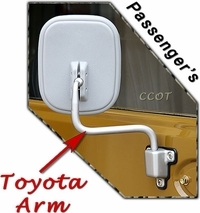 Arm similar to OEM. 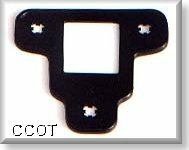 Affordable Solution when running softop or softdoors. Head offers improve rear view over OEM head. Select either black matte or stainless mirror set. Equal quality but better performance than OEM. Developed by CCOT for great savings & superior function. 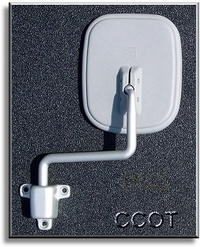 Add $10 to base price for Stainless Mirror Heads. 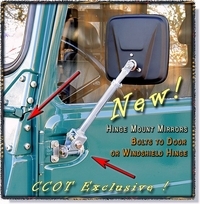 CCOT's windshield hinge mount telescoping mirror arms. 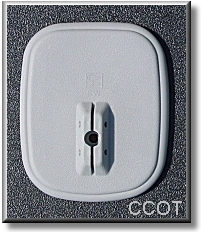 Sold in Pairs with ball screws for mounting factory style heads. Warning: Do not over-tighten set screw with socket wrench. Mirror arm ball sizes vary. 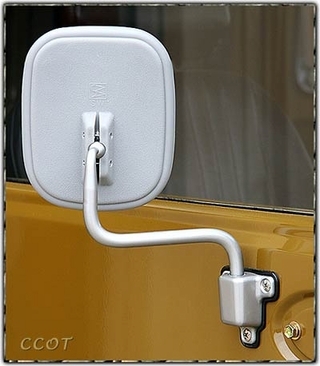 Add lock washer to bottom of Mirror socket to take up slack if needed. 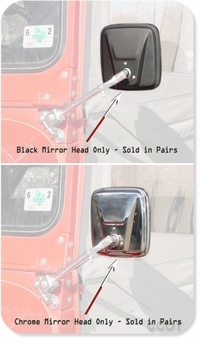 Pair Mirror Heads only - Sold in pairs. Heads offers improve rear view over OEM style heads. 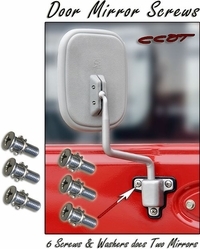 Mirror Door Screw Kit - Stainless - 6 ea. Stainless Steel Machined Screws to Mount Factory Door Mirrors. 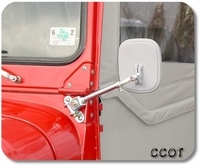 One set will mount both hard door mirrors. Toothed washers take on oval shape when seated. 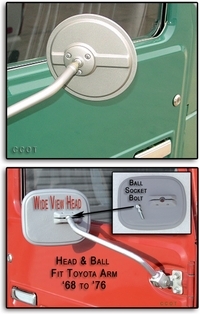 Note: This wide angle head and ball socket combo will also fit CCOT's telescoping mirror arms.